Lock in a great price for Holiday Inn Express Hotel & Suites-Edmonton South – rated 8.5 by recent guests! The room was VeRY spacious and comfortable. We had an accessible room, so it met my accessibility needs. The staff at the breakfast were above and beyond wonderful.so friendly. It was very nice and had a great stay very clean. Booked for a work trip and the hotel met all my expectations, king bed was exceptionally comfortable and it was quiet. Plenty of choices for breakfast. The breakfast better then most places and the location was perfect ! Extremely clean, Pet friendly, fantastic staff who were super friendly. The morning breakfast was great, so many different options to suit everyone. Big rooms, great pillows. The mini fridge and microwave was a nice bonus. Very close to south common. All good .. The staff were very friendly. The breakfast was excellent, bed very comfortable. Location is convenient, and the breakfast is really good. I love the breakfast. Not only the food is good, the staff and their service are excellent. Good value for the money, the bed was comfortable and the breakfast was very good with a lot of choices. Holiday Inn Express Hotel & Suites-Edmonton South This rating is a reflection of how the property compares to the industry standard when it comes to price, facilities and services available. It's based on a self-evaluation by the property. Use this rating to help choose your stay! An indoor pool and hot tub is available at the Holiday Inn Express Hotel & Suites-Edmonton South, only 4 miles from Whyte Avenue. A breakfast buffet is served every morning. Free Wi-Fi is available. 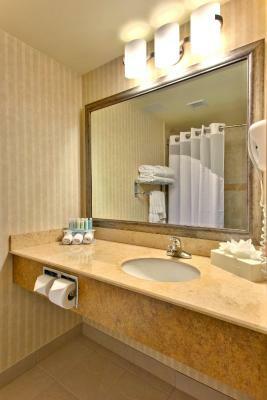 A flat-screen TV is included at the South Edmonton Holiday Inn Express Hotel & Suites. Each unit comes with a microwave, refrigerator, and coffee maker. A desk is also available. Guests can workout in the fitness center at the hotel. A business center and meeting facilities are provided. Laundry services are available on-site. The West Edmonton Mall is a 20-minute drive from the hotel. The University of Alberta is 5 miles away. 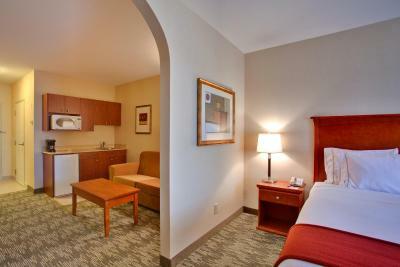 When would you like to stay at Holiday Inn Express Hotel & Suites-Edmonton South? Featuring a flat-screen TV, this room has a microwave, refrigerator, and coffee-making facilities. A desk sitting area is available. Free Wi-Fi is provided. 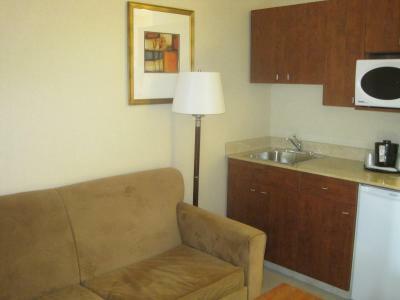 Featuring a flat-screen TV and iPod dock, this room offers a microwave, refrigerator, and coffee-making facilities. A living room offers a sofa bed. A desk seating area is offered. Free WiFi is available. Featuring a flat-screen TV and iPod dock, this spacious corner room has a microwave, refrigerator, and coffee-making facilities. A living room offers a sofa bed. An office area with a desk is included. Free Wi-Fi is available. Featuring a 2-person spa tub, this spacious corner room has a microwave, refrigerator, and coffee-making facilities.A flat-screen TV and iPod dock is available. A living room includes a sofa bed. Free Wi-Fi is available. 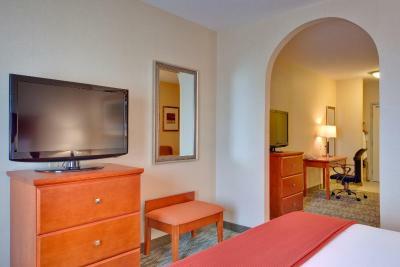 Featuring a flat-screen TV and iPod dock, this spacious room has a microwave, refrigerator, and mini-bar facilities. A living room offers a sofa bed. Free Wi-Fi is available. 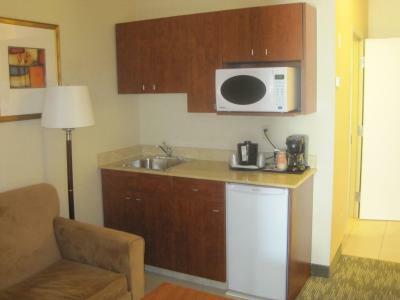 Featuring a flat-screen TV and iPod dock, this room offers a microwave, refrigerator, and coffee-making facilities. A desk is available. Free Wi-Fi is available. A roll-in shower, large button telephone, and accessible cabinets are featured in this room. House Rules Holiday Inn Express Hotel & Suites-Edmonton South takes special requests – add in the next step! Holiday Inn Express Hotel &amp; Suites-Edmonton South accepts these cards and reserves the right to temporarily hold an amount prior to arrival. Holiday Inn Express Hotel & Suites-Edmonton South accepts these cards and reserves the right to temporarily hold an amount prior to arrival. The hallway was overrun with kids running around all hours of the night. Hockey weekend. All the adults appeared inebriated. The hotel is old and felt dirty. Next time I will stay down the road at the Town place suites. It’s only a few dollars more and it’s new and clean and much larger. The elevators are in poor condition. Lots of kids running around the halls. Parking lot was tight the one night and parts of the lot were flooded. Pet fee was higher than other hotels, $25 per night which adds up when we stay multiple nights. Nice clean Large rooms. Good location. We would stay again. I wasn't impressed that they charged us $25.00 per night for our small dog. Their website said "you may be charged for a DEPOSIT for your pet" it did not say anything about actually paying a fee for your pet - they need to update their website!!!! There was a huge group of parents with their teenage girls staying there for a tournament and they allowed them to party until 1 am in the conference room which was kitty-corner to our room and we were also close to the back entrance and could hear everyone checking out in the morning. Also, the pillows were terrible, my shoulders were sore for days after and I ended up buying my own pillow on the 2nd night. The staff was great, very helpful and friendly. The rooms were clean but a little smelly, I think we were in the room that allowed dogs because we had a dog. Only one elevator was working and the wait lines were long to get to your room. No fans in the bathroom. The pool water was quick cold for the kids. Unable to control temperature in room. Too warm at night. On second day, staff did not tidy room. Management said we probably had a "do not disturb" sign out in late morning. NOT TRUE. And management wanted to argue about this? Parking lot was very icy. Location was great. Breakfast is excellent, and staff working the breakfast area were so cheerful and helpful! The hot tub was Luke warm at best and had scum in it. Breakfast was great, room was clean. Happened to be on the same floor as a high school basket ball team. The lifts are a little slow but really that’s minor! Friendly staff. Very clean. Nice pool. Excellent breakfast.